5310 ✉ DRP81 5 Pfg. 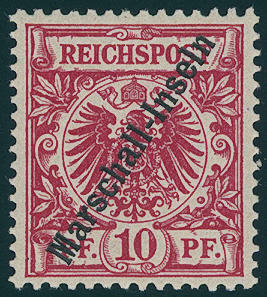 Germania, double postal stationery requires moderately There and returned from \"GÖTTINGEN 14.11.09\" to Jaluit with arrival postmark, answer part from \"JALUIT 11.5.10\" to Göttingen and forwarded to Marienwerder. 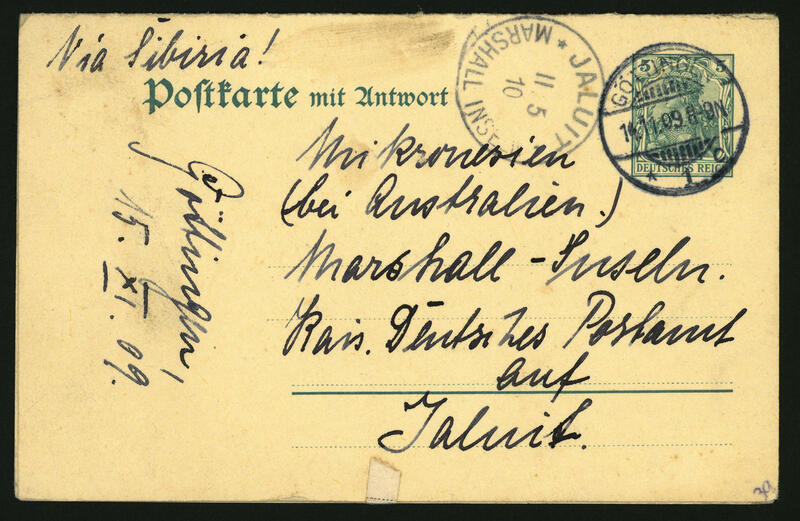 Both card parts with handwritten routing indicator \"VIA SIBIRIA\". Extremely rare commercially used item! 5311 1/4IU 3-20 Pfg. 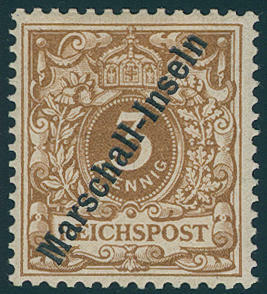 Berlin initial printing issue, all fours values wonderful fresh colors and well perforated with original gumming, in perfect condition unused. A very scarce, nearly always missing issue! Photo expertize \"faultless condition\" Jäschke-Lantelme BPP. 5312 1/6IU 3-50 Pfg. 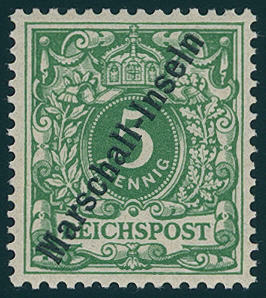 With overprint \"marshal islands\", the very scarce so-called \"Berlin initial printing issue\", all six values fresh colors and very well perforated, in perfect condition mint never hinged in utterly perfect condition. There are only few complete sets in this quality have been preserved! Photo certificates Bothe BPP. 5313 ∆ 1Ia 3 Pfg. 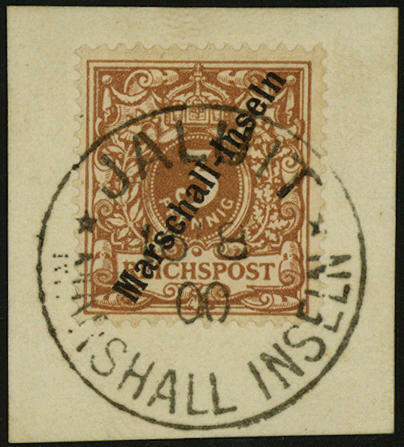 Pale ochre-brown, Jaluit-issue, wonderful having bright colors and good perforated outstanding quality on very nice letter piece with perfect centered, full and clear mounted single circle postmark \"JALUIT marshal islands 21.7.29. \". A piece of dream of this rare issue for the highest standards! Photo expertize \"faultless condition\" Jäschke-Lantelme BPP. 5314 ∆ 1IaI 3 Pfg. 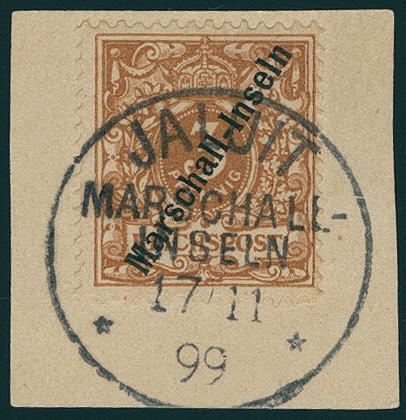 Yellow brown Jaluit-issue with plate flaw \"break in the ribbon roll at the bottom on the right\" and on of this issue scarce stamp \"JALUIT Marshall Islands 16.8.00\" razor-sharp on magnificent white letter piece. 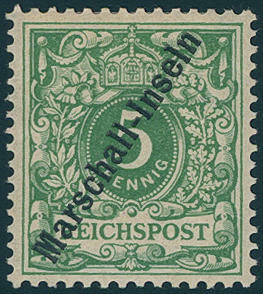 The stamp is in wonderful having bright colors condition, first-class perforated. In this regard an utterly absolute copy this large colonial rarity for your highest requirements! Photo expertize Jäschke-Lantelme BPP. Michel 9500,- €. 5315 1Ib 3 Pfg. Bright brown ocher, Jaluit-issue, wonderful fresh colors and very well perforated, in perfect condition unused with original gumming. Unused examples of this rare first issue are extraordinarily rare. An exception copy in perfect condition! Photo expertize \"complete flawless\" Dr. Steuer. 5316 ∆ 1Ib 3 Pfg. 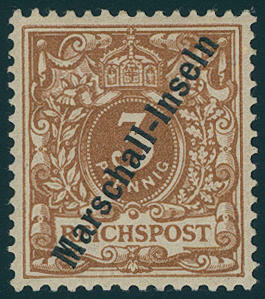 Bright brown ocher, Jaluit-issue, wonderful fresh colors and well perforated on very nice letter piece with perfect, clear single circle postmark \"JALUIT marshal islands 17.11.99. \". An outstanding quality for the highest standards! Twice signed Bothe BPP, photo expertize Eichele. 5317 ✉ 2/4II,7,11 5 Pfg., 10 Pfg. And 20 Pfg. 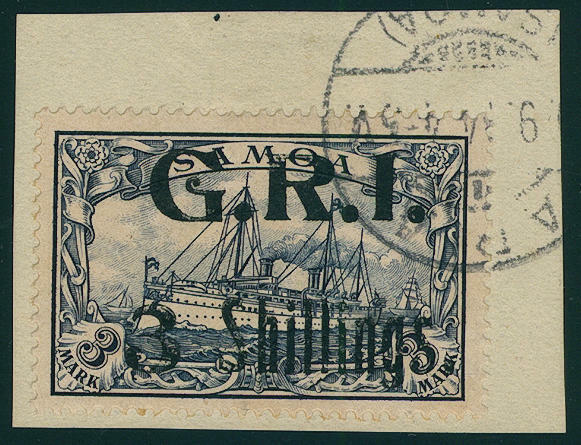 With overprint \"marshal islands\", as well 3 Pfg. And 25 Pfg. 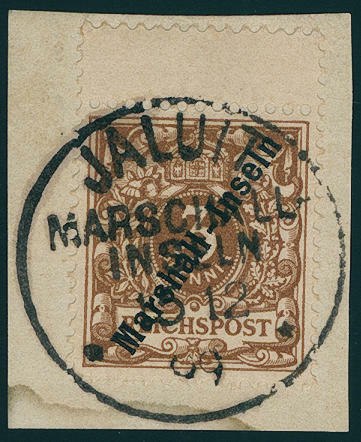 With overprint \"Marshall Islands\" on cover front with extremely scarce provisional registration label \"JALUIT (marshal islands) \", all values with clear single circle postmark \"JALUIT marshal islands 24.11.99. 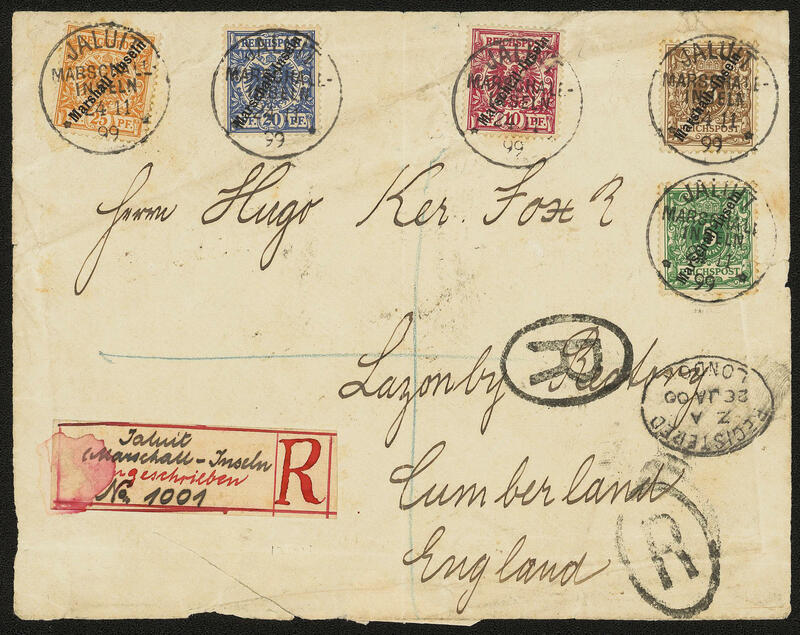 \" to Cumberland / England with registered stamp \"REGISTERED LONDON 28. Yes. 00. \". 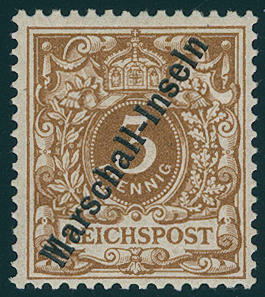 The stamps partly with faults. An exceptional interesting and very rare document! 5318 5II/II 25 Pfg. 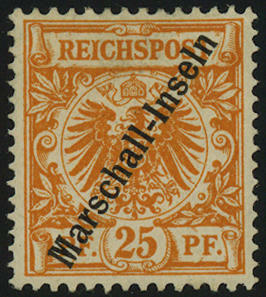 Yellowish orange, Berlin issue, with the very rarely plate flaw I of imperial post above cleaved, fresh colors, very well perforated and in perfect condition unused. According to Michel is the plate flaw on of this stamp only unused known and not calculated! 5319 ∆ 7b 3 Pfg. Bright orange brown with above attaching gutter, fresh colors and well perforated on very nice letter piece with clear, full mounted single circle postmark \"JALUIT Marshall Islands 15.12.99. \". 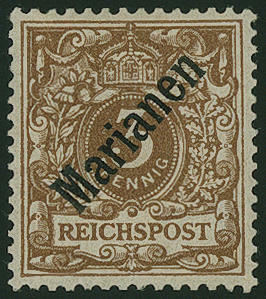 An attractive copy of this rare colour! Photo expertize \"faultless condition\" Jäschke-Lantelme BPP. 5320 13/25 Ship set unwatermarked, fresh colors and very well perforated, in perfect condition mint never hinged, key value with photo certificate \"perfectly mint never hinged condition\" Steuer BPP. 5321 ✉ 15,16 10 Pfg. And 20 Pfg. 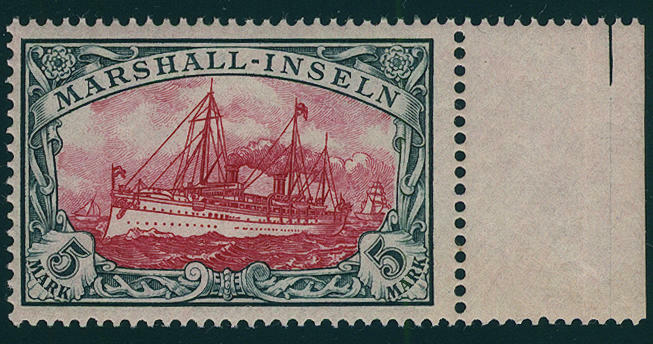 Imperial yacht, fresh colors and in perfect condition as correctly franked on very nice registered cover with single circle postmark / Jaluit Marshall Islands 1.4.08. 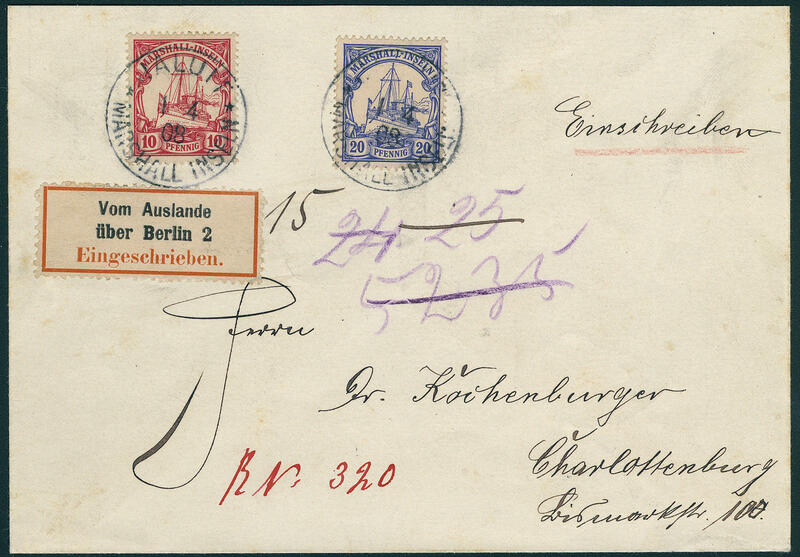 To Charlottenburg with arrival postmark. The cover is carrying provisionally registered note \"RN 320\". In Germany was the registration label \"from foreign country over BERLIN 2 registered\" affixed. 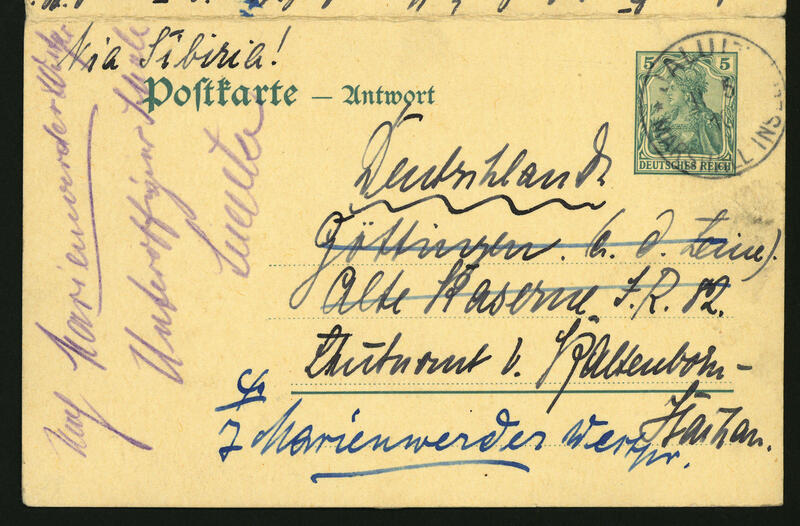 Letters from the German colonies with the German registration label are very rare, which here is a particularly beautiful example! 5322 25 5 Mk. Imperial yacht unwatermarked, in perfect condition mint never hinged right margin of sheet, without any signs. Michel 650,- €. 5326 ∆ 12 3 Shillings on 3 Mk. 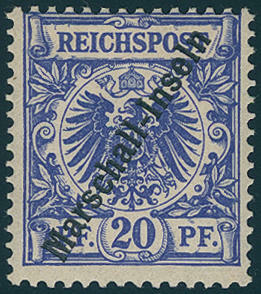 Violet black, fresh colors and very well perforated on magnificent white letter piece with clean mounted stamp \"APIA\". 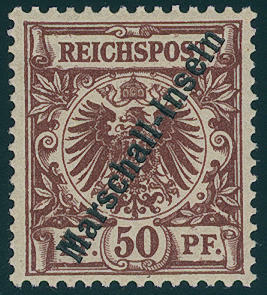 An outstanding quality of this rare and sought-after issue with an edition from only 458 pieces! Photo certificates Peter Holcombe, David Brandon. 5327 ∆ 13 5 Shillings on 5 Mk. 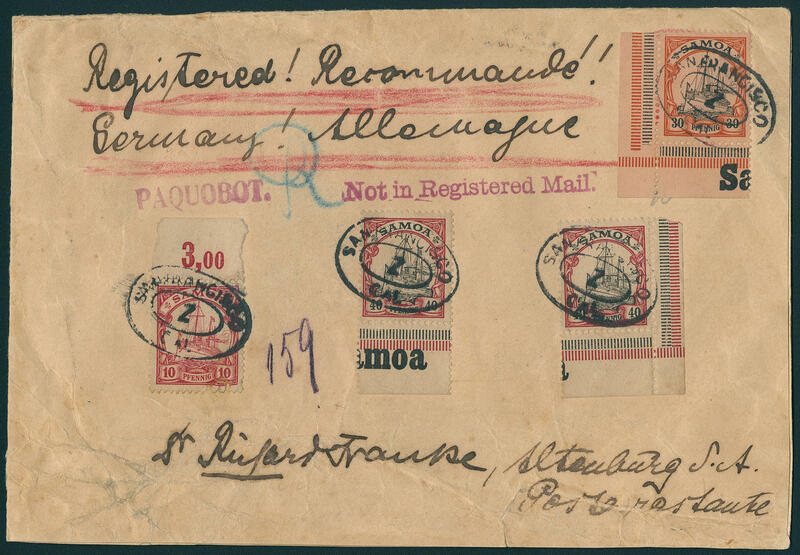 Green black / red from right margin of sheet with marker cross on margin to facilitate cutting or perforating of panes, fresh colors and very well perforated on magnificent white letter piece, neat cancelled \"APIA 9.9.14. \". An outstanding quality this sought-after issue for the highest standards! Photo expertize \"the stamp is in all the finest, having bright colors and utterly perfect condition\" Bothe BPP. 5324 ✉ 8/10,15 5 Pfg. 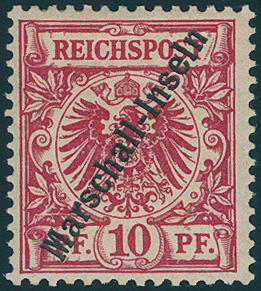 4 time from lower margin (including pair with country inscription), 10, 20 and 80 Pfg. 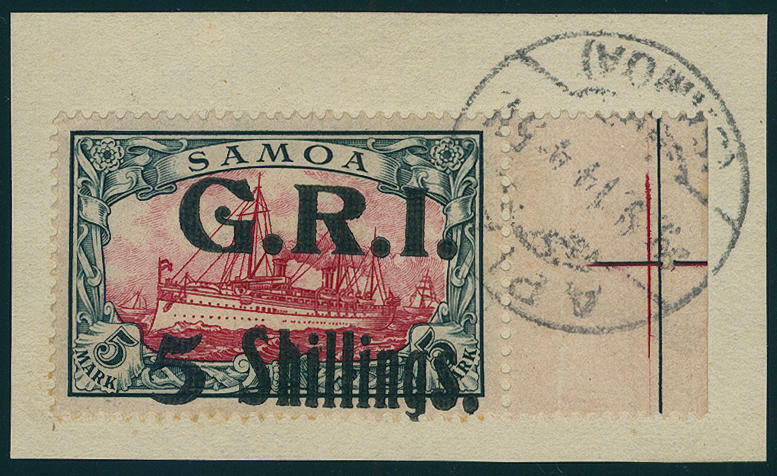 From margin of sheet on cover, in Apia / Samoa direct on board ship dispatched, the stamps in the port of arrival with single circle postmark \"AUCKLAND 2. Yes. 08\" tied by additional very scarce frame cancel \"LOOSE letter\". Very decorative and in this kind extremely rare. 5325 ✉ 9,12,13 10 Pfg., 30 Pfg. And 40 Pfg. (2), all from margin of sheet, 10 Pfg. 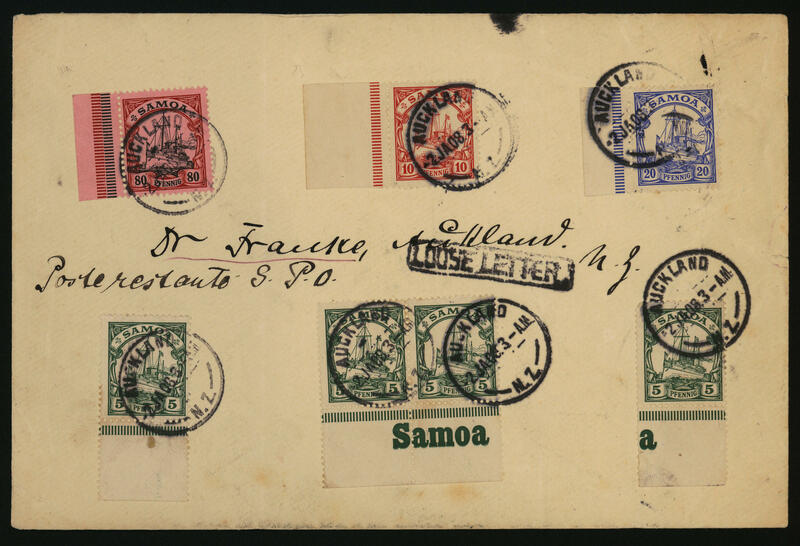 Damaged affixed, on attractive, as registered provided envelope, two-sided opened and some shortened, outside of the franking a little crumpled, with oval cancel \"SAN FRANCISCO\", senders note \"APIA\" with violet one-line cancel \"PAQUOBOT\" and one-line cancel \"adversity IN REGISTERED MAIL\" with on the back transit cancellation \"SAN FRANCISCO 22. MAR. 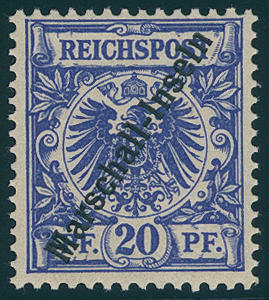 1909\" to Altenburg. In this kind an extraordinary and rare cover! Photo expertize Buehler. 5295 ✉ 1/6I 3-50 Pfg. 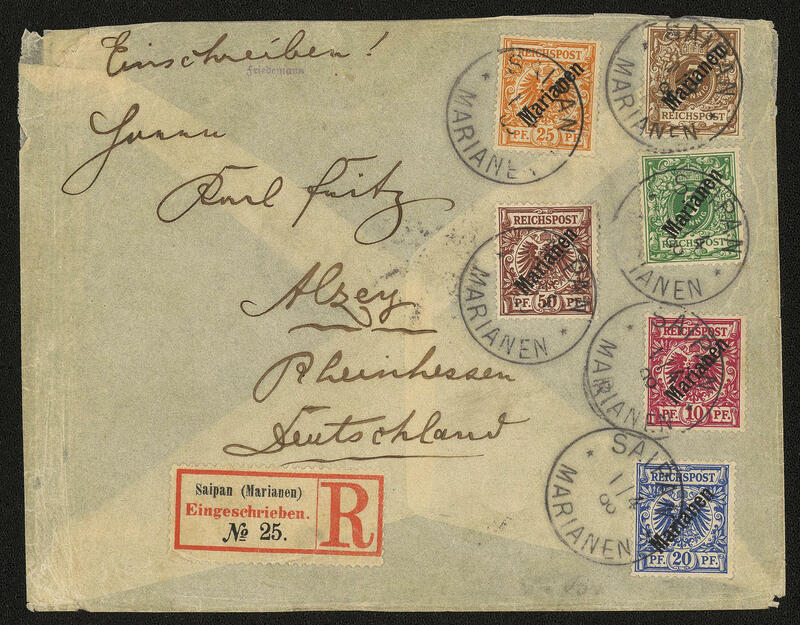 Diagonally overprint, all six values fresh colors and in perfect condition as decorative and scarce set franking on registered cover, used in the correct time before the stamps were demonetized with single circle postmark \"SAIPAN the Mariana Islands 1.4.00. 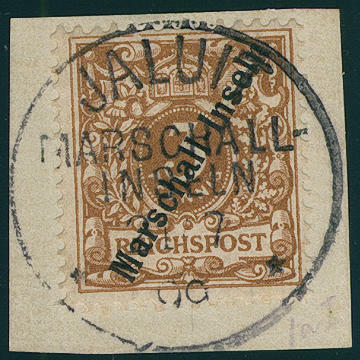 \" to Alzey with arrival postmark. Such set frankings this sought-after issue are very rare! Photo expertize Steuer BPP. Michel 14800,- €. 5296 1I 3 Pfg. 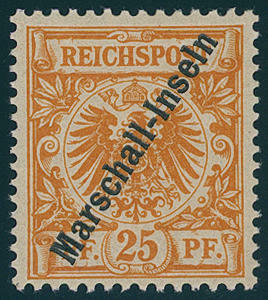 Bright orange brown, diagonally overprint, fresh colors and very well perforated, in perfect condition unused in perfect condition. An especially nice copy this very rarely issue! Photo expertize Bothe BPP. 5297 ∆ 2I 5 Pfg. 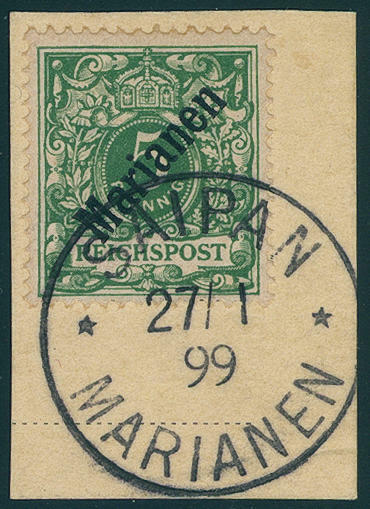 Opal green, diagonally overprint, fresh colors and well perforated on very nice letter piece with pricked clear, date-appropriate single circle postmark \"SAIPAN the Mariana Islands 27.1.99. \". A wonderful copy of this rare and sought-after issue! Photo expertize \"faultless condition\" Jäschke-Lantelme BPP.